Hanoi is taking the first steps on its way to become a smart city, aiming to help turn Vietnam into a modern-oriented industrial country by 2020. According to a Politburo resolution, Hanoi must strive to be the leading locality in promoting industrialisation and modernisation. The Hanoi People's Council has also issued a resolution on building a smart city, via the adjustment to the “Programme of applying information technologies in State agencies’ operation in Hanoi in 2016-2020”. The budget for implementing the programme was lifted to 3 trillion VND (more than 127.7 million USD) from 1.25 trillion VND, creating a foundation for Hanoi to promote socio-economic development and become a smart city. According to Nguyen Ngoc Ky, director of the municipal Department of Information and Communication, the process for developing Hanoi into a smart city includes three phases, focusing on forming core parts, smart systems and a digital economy; encouraging locals to join social management; and developing a knowledge-based economy. Currently, Hanoi is working to build the smart infrastructure in transport, tourism, health, environment and energy, while paying heed to human resources and ensuring security and social order. Chairman of the municipal People’s Committee Nguyen Duc Chung said the basis of an e-Government has also been slowly formed, adding that the city completed the building of a population database for more than 7.5 million people and connected wide area network (WAN) to all departments, 30 districts, towns and 584 communes and wards. 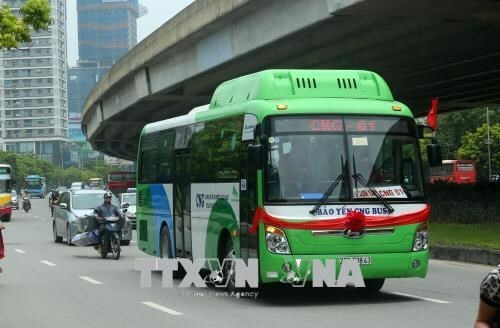 This year, Hanoi is focusing on building a smart governance centre and developing some basic smart transportation and tourism infrastructure systems, Chung noted. Three functional centres of the smart governance centre have been set up, including those for monitoring information confidentiality and safety, supporting staff in using information technology and managing media information. The building of some basic components of smart transport systems such as an integrated traffic information system, a system for monitoring and handling road traffic violations by images and a smart traffic signal control system, is also underway. Additionally, an online tourism information portal, mobile applications for tourism and an online Hanoi tourism map application will be put into operation soon, Chung added. As well as smart governance, transportation and tourism centres, Hanoi is also concentrating on establishing other basic infrastructures for the energy, education and health sectors, towards creating a better living environment for citizens. Smart cities are places that apply information technology and artificial intelligence to manage urban life, improve the quality of government services and effectively use energy resources. Prime Minister Nguyen Xuan Phuc recently approved the sustainable smart city development plan until 2025 with a vision toward 2030. The plan aims for Hanoi, Da Nang, Ho Chi Minh City and Can Tho to become smart cities based on green growth and sustainable development, utilising the strengths of the cities to raise the living standards of residents.